← Why go to exhibitions? What title should I give this post? As Juliet said “What’s in a name? that which we call a rose by any other name would smell as sweet”. But how important is a title to a work of art? The photographs produced by Cindy Sherman are usually Untitled. 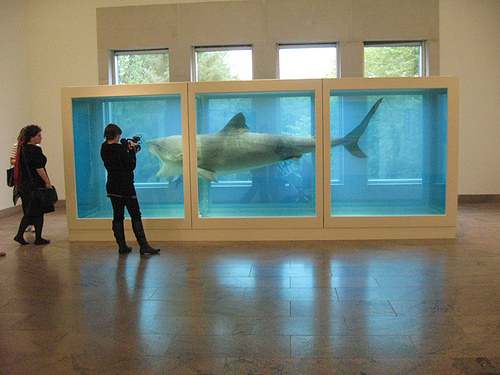 Damien Hirst, on the other hand, always seems to have obscure titles such as “The Physical Impossibility of Death in the Mind of Someone Living”, the “real” name for his famous shark in formaldehyde sculpture. His spot paintings are often named after drugs. In a chat at Hot Bed Press the other day I heard the view that to leave a work of art untitled was “arrogant”. Is this so? Or should a work “be able to stand on it’s own merits without any other baggage” as Mike of destructivetesting says? Or should the title “take you out and push you back into” the work as Hirst says? Sorry, no answers, only questions! This entry was posted in Art, Artists, Works and tagged alyson stanfield, art, artist, cindy sherman, damien hirst, title, untitled. Bookmark the permalink. 34 Responses to What title should I give this post? It’s an interesting question, for sure. Personally, I give ambiguous and often fantastical titles to my prints in order to lay some groundwork for the viewers imagination to run wild with the images, but not make my intent transparent. I feel that art should be open to interpretation, and my making it is not the end to what the piece “means”. That a personal and unique relationship forms between each work and the viewer discovering it. Giving strict descriptive titles forces my perspective into the equation and somewhat diminishes this interaction. Titles of two of my prints come to mind. Firstly, I recently printed “IWM North” since it is the Imperial War Museum North, at Salford Quays. (You can see it on my site, ) The fact that the title stated what it was doesn’t detract, as far as I am concerned, from the fact that it is an amazing modern building which lends itself to an almost abstract image. Secondly as my contribution to Hot Bed Press’s 20:20 print exchange last year (there’s a flickr site somewhere with all the prints on ) I produced an abstract print made up of golden yellow rough vertical stripes which I called “Weird scenes inside the goldmine”. The colours were gold and the rough stripes could have been pit props, but the main reason was I liked that line from an old Doors’ song – some people even recognised the reference! I could care less…I will bring my experience as a a viewer and make the viewing of any piece my own. I love this post. Made me laugh out loud thinking on variations of “Untitled No 3 – take the garbage out” etc, and reconsider my own lame titling efforts. I like titles, so vote in their favour. I’m thinking of producing a series of screenprints all called “Untitled is not a title No. #” but I think this may confuse people! What a great discussion! I agree with Hirst in that it can add to work with a great title. Sometimes art doesn’t need an explanation because there isnt anything intellectual behind it – it’s just striking or aesthetically pleasing. As an avid art observer I like an explanation if there is one.